Paul Marriner was born in Halifax in 1944, Paul went to Dalhousie and Nova Scotia Tech, and graduated in Mechanical Engineering. He taught at the Royal Military College in Kingston where he also received a Masters Degree. Paul now owns and operates Gale's End Press. A member of the Outdoor Writer's Association of Canada and the Outdoor Writers Association of America, he is Associate Editor and a columnist for The Canadian Fly Fisher, the fly-tying columnist for Eastern Woods & Waters, a Field Editor of Outdoor Canada Magazine, a Field Editor for Eastern Fly Fishing and a masthead contributor to The Angling Report. Paul's articles have appeared in magazines on five continents, and number in the hundreds. His latest work, A Compendium of Canadian Fly Patterns (co-author), was released June 1, 2006. How to Choose & Use Fly-tying Thread, was published in July of 2004, and Stillwater Fly Fishing: Tools & Tactics, in late 2003. 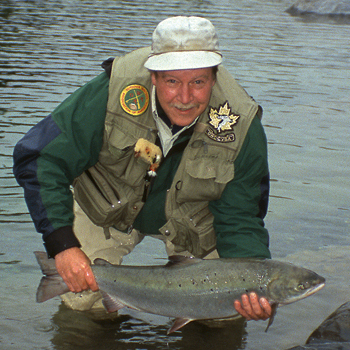 Paul also authored Atlantic Salmon - A Fly Fishing Primer (an Outdoor Writers award winning book in 1994), The Ausable River Journal, The Miramichi River Journal, and Modern Atlantic Salmon Flies (an Outdoor Writers award winning book in 2000). He has also contributed to several anthologies. In 1991 Paul won the Gregory Clark Award for outstanding contributions to the arts of fly fishing. For more information on Paul, his books and publishing company visit his website Gale's End Press.